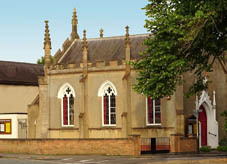 For over 170 years Evington Chapel has witnessed to God’s good news to those around. You are invited to join with us – we all have more to learn of our God, and Jesus Christ whom He has sent. We are ordinary people, from all walks of life, who have the same sorrows, joys, cares and concerns that are common to us all. We are called Baptists because according to the Bible the first Christian churches were made up of people who repented of their sins, believed on the Lord Jesus Christ and were then baptised by being immersed in water. We follow the practice of those early Christians.